Ecowarm RadiantBoard offers the best balance of high-performance, cost and environmental responsibility in the radiant floor board heating market. Ecowarm RadiantBoard delivers heat faster and more efficiently than most other radiant subfloor delivery systems (underfloor, concrete, gypsum pour, etc.) resulting in lower operating costs and greater comfort. 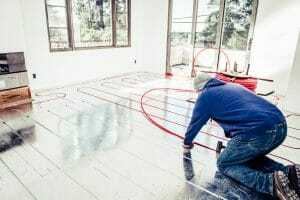 Ecowarm RadiantBoard offers the best balance of high-performance, cost, and environmental responsibility in the radiant floor panel heating market. Ecowarm RadiantBoard permits lower supply water temperatures resulting in higher efficiency and lower utility bills. Ecowarm RadiantBoard is only ¾” thick making it ideal for radiant floor remodels or retrofits where floor heights can be a limiting factor, particularly at doors and stairs. gn, but using too little would mean an underperforming system and using too thick an aluminum layer is adding cost without value. Think of the thickness of the aluminum like a water pipe where a certain size pipe will meet the energy needs of the house and a greatly oversize pipe will not deliver more energy but is just a costly big pipe. Most modern houses meeting energy codes have heat losses between 13-20 BTU.SQ FT/Hour and operate much of the year below their maximum heat loss. The thickness of the aluminum on Ecowarm RadiantBoard is chosen to be very effective in this range requiring low water temperatures and is capable of generously exceeding this up to 42 BTU SQ FT/Hour with modest elevations of water temperatures. What is the importance of rapid acceleration? The conductive aluminum layer means our radiant board heats up rapidly (up to 5 times faster than concrete or Gypsum). Get the heat when you want it. Rapid response means Ecowarm RadiantBoard can be appropriately used with setback thermostats. Ecowarm’s responsiveness is also valuable in climates where heating loads can vary dramatically such as when there is both a heating and cooling load on the same day. Contrary to old-time radiant design thinking, a low thermal mass is much preferable to a high mass system. Why is Ecowarm RadiantBoard so efficient? 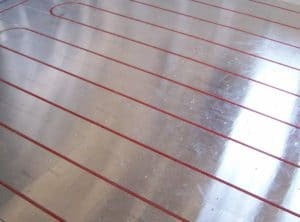 The low mass of our system, the placement of the tubing close to finished floor goods and the tremendous conductivity of aluminum combine to allow Ecowarm RadiantBoard to produce the same heat output as most systems with lower supply water temperatures. Lower supply water temperatures mean higher efficiency resulting in lower utility bills. How does Ecowarm RadiantBoard achieve quality and environmental responsibility? Ecowarm RadiantBoard is made using high quality 6 or7 ply American made plywood available as FSC® sustainable certified plywood. FSC certification means the wood is certified sustainably grown and harvested. Ecowarm RadiantBoard utilizes made in America aluminum with recycled content and No VOC water-based adhesives. Many of our competitors use lower quality plywood of oriented strand board (OSB) or MDF in their products. In addition to its green qualities, high-grade plywood is the substrata preferred by many for nailing hardwood in quality homes. Why is a slightly undercut groove so important? Tubing is “walked” into our slightly undercut groove. 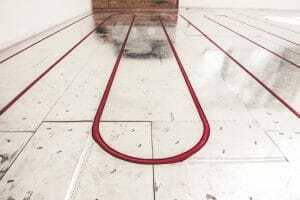 This means the PEX tubing is firmly retained for better heat transfer, for ease of installation and assures Ecowarm RadiantBoard will not tick or create sounds after installation. 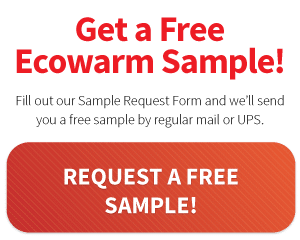 What makes Ecowarm RadiantBoard easy to install? The Ecowarm RadiantBoard board size (nominal 2′ x 4′) is easy to handle and install and can be easily cut with table or skill saws. Ecowarm RadiantBoard can be stored inside and applied easily in the flow of a project, avoiding delays. It is glued and screwed or cross stapled to a wooden subfloor or glued/floated on a concrete slab. It can be installed early or late in a job and at a wide range of temperatures, unlike gypsum or cement that are subject to freezing in cold weather. What makes Ecowarm RadiantBoard so such a good value? Ecowarm is sold factory direct to you the contractor, cutting out the layers of distribution costs. The aluminum layer is sized for excellent thermodynamic performance in modern homes and cost-effectiveness. It uses high-quality materials while simultaneously being an exceptionally green product.